Copenhagenize.com - Bicycle Urbanism by Design: New York's Copenhagen Square? A loooooooong john in Christiania, Copenhagen. New York's Times Square has been transformed into a mall. I knew about this, of course, as well as the Copenhagen influence on the move, but it was interesting to read this article in New York Magazine. "... that she drew inspiration from the Strøget, the spine of streets through the center of Copenhagen, which was gradually transformed into a genteel pedestrian thoroughfare. But her Times Square takeover also recalls a different Copenhagen institution: Christiania, the decommissioned military base that hippies colonized in the early seventies, banging together a livable town out of salvage and good cheer." Strøget, fair enough. The pedestrian street from the 1960's that launched the work to reclaim the streets in Copenhagen from the exploding car culture of the time is legendary in urban planning circles and an inspiration for many cities. But Christiania? I think it's enormously cool that this comparison is made, although I have difficulty understanding it. 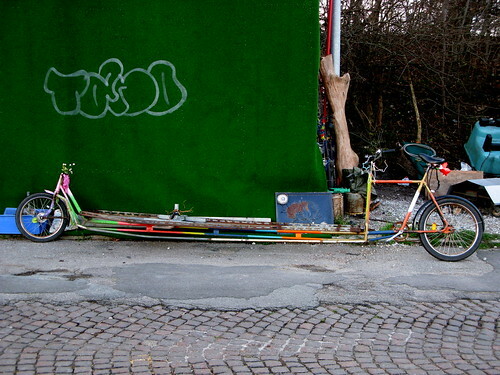 Christiania was squatted in the early seventies and it has been called Europe's greatest social experiment. This anarchist town seems an odd influence on a large square in one of the world's most conservative nations. But hey. Like I said, it's a cool comparison. What do our New York readers think about the new zone on Times Square?